Live Transport Containers | BARR Plastics Inc. Both insulated transport containers are FDA approved. There are three drains located within one of the short ends of the D345 container. They are located at specific heights for proper water circulation; one drain for pumping water into the tub and two other drains at different levels for overflowing the exit water. The D345 is standard with six heavy-duty clamps that work together with an optional lid seal to provide you with a water-tight box. This is extremely important to the transport of live product. 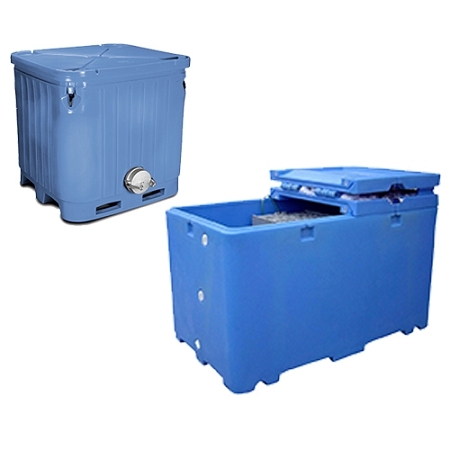 The D345 insulated container was designed around the needs of the Atlantic Coast Lobster Fishery. As the flap nest lobster crate is the industry standard for lobster holding, the D345 was designed to hold up to six crates and each crate can hold up to 100 lbs of lobster. This tub is multi-functional to be used for fin-fish harvesting, all types of shellfish harvesting and for the live transport of species such as tilapia, bass, trout and eels.